There’s so much to do and see in the Big Apple, but, even better than that—there’s so much to eat! When you live like a local at a vacation rental you that found with the help of thedinosaurhaus, your source for the best vacation rentals in NYC, you’ll want to eat like a local too. 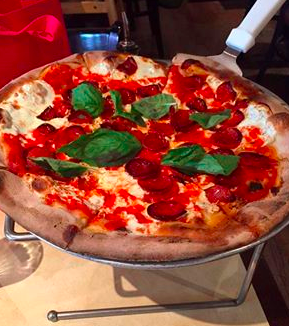 Pizza: There’s great pizza in every NYC neighborhood. Top contenders include Patsy’s Pizzeria and Lombardi’s Pizza in Manhattan and Juliana’s Pizza and Di Fara in Brooklyn—but a personal pizza journey is a must to uncover your favorite. Bagels: It’s the quintessential New York breakfast. Grab a bagel at the old standby Ess-a-Bagel in Midtown East, Black Seed Bagels, the popular newcomer in SoHo, or discover a new spot near your vacation rental. Cronuts: This specialty by the Dominique Ansel Bakery in SoHo has taken the city by storm, inspiring hundreds of New Yorkers to wait in line before dawn to sample this delicious delicacy, a cross between a donut and a croissant. Prove your mettle by braving the crowds to get a taste of one yourself. Dim Sum: The streets of Chinatown are lined with restaurants serving delicious Chinese dishes—some familiar, some very exotic. A great way to spend an afternoon is over dim sum, where you can assemble a variety of small plates to make one very memorable meal. When you’re ready to embark on a food tour of New York City, remember to plan your stay at a vacation rental from the thedinosaurhaus. To learn more about the best vacation rentals in NYC, call (646) 233-1442 or visit their web site.